World Flower - Castle is the castle of World Flower in New Super Mario Bros. 2. The boss of this castle is Lemmy Koopa. This castle is made up of grey bouncing Mushroom Platforms and conveyor belts. Mario begins on the castle floor beside one of the bouncy mushrooms and a conveyor belt. Moving on, there is a blue pipe between two bouncy mushrooms which constantly releases Bone Goombas under a ? Block containing a Fire Flower. Further down, two red pipes on the ceiling can be found constantly releasing Bob-ombs. More Bone Goomba-releasing pipes can be found. The next section features blue and red pipes releasing Bone Goombas and Bob-ombs, respectively, at the same time above several conveyor belts. This is followed by the checkpoint. More conveyor belts follow, along with bouncy mushroom platforms and Bone Goomba-releasing pipes. Mario has to jump over several gaps at this part. 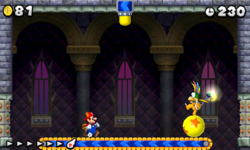 After that, there is an area with bouncy balls, found previously in World 3-Castle of New Super Mario Bros. Wii, which bounce around below several Brick Blocks, pushing Mario away or assisting him in bouncing. One of the Brick Blocks is a Coin Block. After that are more conveyor belts and Bone Goomba and Bob-omb-releasing pipes between yellow platforms which constantly move up or down. After that, there is a blue conveyor belt moving left and a switch on the ceiling. This switch reverses the direction of the conveyor belt and changes its color to red, and vice versa. Several more conveyor belts follow, along with two ? Blocks with coins, and the boss door. Here, Mario must defeat Lemmy Koopa. This takes place in a room on a conveyor belt. Its direction can be reversed with a switch on the ceiling. Lemmy's attacks are like those in World 3-Castle of New Super Mario Bros. Wii, making bouncing balls appear to push Mario off the conveyor belt. Lemmy will occasionally move from right to left and vice versa. When he does this, he first releases a bouncing ball, which pushes the switch on the ceiling and reverses the conveyor belt's direction, so that Mario moves away from him. Mario has to stomp Lemmy's head three times, avoiding his shell attacks. The key to the next world, World 5 thens appear and the level is then completed. Completing this level unlocks World 5-1. Star Coin 1: This Star Coin is found underneath several unbreakable stone blocks between two conveyor belts under the first two red pipes releasing Bob-ombs. Mario must light up and carry a Bob-omb to the stone blocks to break them and then carry another and drop it down to the Star Coin. Star Coin 2: This Star Coin can be easily found and collected above a bouncy mushroom platform under two Bone Goomba-releasing pipes after the checkpoint. Star Coin 3: When Mario reaches the blue conveyor belt before the boss door, Mario needs to push a switch on the ceiling and reverse its direction, then stand on the conveyor belt and crouch until he enters an area with the two bouncy balls and the Star Coin. Mario can leave the area through an orange platform found at the top. This page was last edited on April 13, 2019, at 08:57.